NorthStarr Media Group’s Client: CourtSmith Basketball Industries a basketball apparel, and shoe design company that designs sports uniforms. NorthStarr’s Notes: Reminiscent Video Advertisement is a term we haven’t seen coined or explained. However, we feel it’s fitting for a particular style of video that reflects on a certain time frame in life. The idea is to present images that cause people to resurface emotions that are connected to their past or a similar scenario. 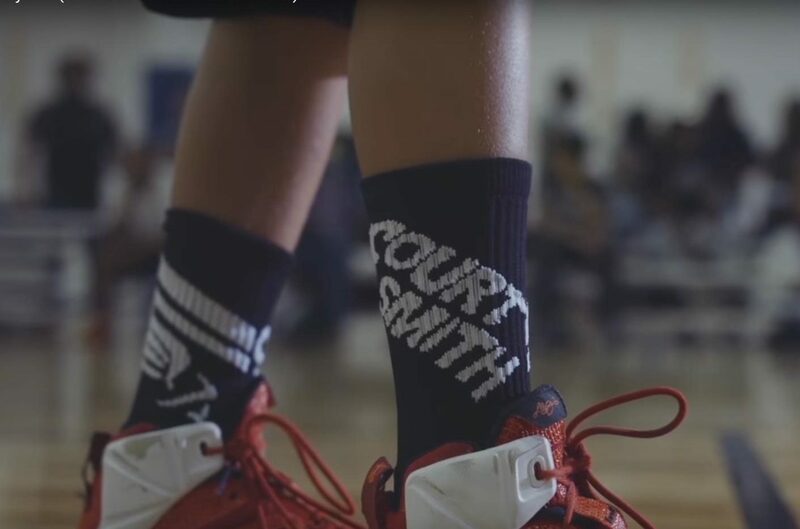 We will examine the scenarios used in the two CourtSmith Basketball Industries ADs. The goal of the video was to bring awareness to the brand while highlighting the apparel in a subtle fashion. The approach that was taken was based around moments that a basketball player, notable an AAU (Amateur Athletic Union) player experiences. However, if we take a look at the first “Reminiscent AD” entitled “Day 1” the focus isn’t only on the players but the parents. In this case the mothers. It takes a chronological storytelling approach, showing the mother introducing her son to basketball at the age of two. The tone was set when the mother gives her son what is quite often a basketball player first court, an indoor basketball hoop. The mother holds her son on one side of her, with the ball in her other hand. He is taught to shoot at the age of two; by four he has gotten the hang of it. In fact he’s dunking the ball on his court. At age seven he has a personal basketball trainer. His mother shows her support by bring her work from her job to his workout session. As he settles into his early teens (13), she takes him to the neighborhood park to play one- on- one with another young basketball player. The mother stays with the other Basketball Mom and watches them as they dual it out on the court. Street ball can be much rougher, than organized basketball. As a result of this environment, the son ends up injuring his ankle. His mom is there to care for him and his injury. She doesn’t only support him as an athlete but as a “student athlete” thus, she helps him with his homework. He doesn’t waver away from his basketball training regimen. He continues to work hard however, there is a bit of a clash with him and his trainer that gets resolved. At age 17 he has the proper mentality, parental support and skills to match. This is displayed during his finally workout session before making the game winning layup. Just as his mother was there from the start, she is there for this moment. The difference is he now understands and appreciates the love and support that she has given him. After hitting the biggest shot in his young career, he looks for his mom. His mother is so proud of him and his journey that she is overwhelmed with emotions. The key to producing an effective “Reminiscent Video AD” is connecting with people from an emotional stand point. This should always be the goal in any video project. However; the challenge is to tap into dormant or old emotions that people may not have visited in quite some time. One must understand the topic to the fullest extent in order to create images that can trigger the desired past feelings. While this video provides these types of scenarios, there are some very universal moments that travel outside of their target market such as, love, care, and support. For example, a mother sacrificing her time to make sure that her son is supported. This action isn’t just germane to basketball or sports it can be interchanged with any topic of one’s choice. The common thread is love, care and support. Other scenes that harbor these three emotions are when she helps him with his homework, when she wraps his ankle, and of course the image of joy and emotion displayed at the very end of the video by this proud mom. Examples of scenes that deal with digging up the past are centered around the first basketball court, the workout scene, the one-on-one basketball street battle, and hitting the game winning shot. People store these moments away in their memory bank. For some people these feelings are still at the surface for them. In sports, people have defining moments, and in the case of basketball, there are lessons that transcend the court. Many take those experiences with them into adulthood and it has a tendency to spill over into people’s professional and or personal life. It gives people the skills to overcome obstacle, creates great work ethic, and stick-to-itiveness. Psychology we often connect how we became who we are to a particular moment or experience in our lives. With this types people there isn’t any deep digging needed. The second video entitled “Dream Big, Go Hard” digs into a more isolated, behind-the-scenes time that a basketball player or athlete encounters-The Halftime Speech. In this case, the coach feels that the team isn’t playing up to their fullest potential. They are losing the game! Their coach takes them through a few different emotions based on his understanding of his team. He first uses the “attention-grabber” approach by pacing and then throwing the clipboard without any warning. It’s so unexpected that one of the players is caught off guard and jumps. We get the sense that this team thinks they are so good that they don’t have to work hard or even try. The coach brings them to reality with his reoccurring statement “Ain’t Nobody Checking for you” which translates into “you aren’t as good as you think you are. You can always do better. You still have a long way to go before you have mastered the game of basketball.” His star player displayed that this sort of reiteration is needed mumbling under breath, “He ain’t talkin’ about me.” The coach quickly addresses his rebuttal by saying in a powerful, stern voice, “Nobody”- pointing and getting in his face. Coach then explains that nothing will be handed to you in life. The only way to get the most out of your talent is to work hard. The coach explains that how you mentally go into a game can have an effect on if you will be able to compete or not. However, playing hard in all aspects of the game- both offensive and defensive can have a profound impact on the game. He also emphasizes that the team must consistently play hard to have a fighting chance. There is a moment when he singles out a player that he feels isn’t giving a strong, consistent effort. He follows that up with a speech on the importance of trusting your teammates and playing hard for each other. Each player is affected by the different stages of his halftime speech. During the early tear down portion they weren’t on the same accord. Even though they were losing the “Star Player” felt that he was exempt from the speech because he had exceptional talent. For those that have been in that setting, there are often teammates that don’t always buy into the team concept. A lot of times it’s the player that’s highly touted. Great coaches will address this issue each and every time a player shows that he or she isn’t embracing the team concept. For those that have been on a team with players like this or might have been this player themselves should have a connection to these moments. This coach doesn’t show any favoritism. He addresses the lack luster performance that the “Role Playing” teammate is putting forth, by highlighting that he has been “taking plays off. It is the coach’s aim to show steer all players in the right direction even past the sport of basketball. These are life lessons that many coaches teach via Basketball. Working hard and being a team player is not just a great skill for basketball, but life. The reality is that even the players in the NBA will play for a short period of time as it compares to life. Sometimes, young teenagers don’t see the correlation at the time. As they age there is a good chance that reflection happens. This type of environment is very familiar to those that played basketball, thus it takes one back to their past. For those that currently play organized basketball, the connection can perhaps be made faster because the experience is so much fresher for them. This coach doesn’t leave them with negative feedback on their minds. He builds them back up explaining the importance of team camaraderie. It’s at this point that we see the selling of the team beginning to happen. The energy is starkly different then when they first came in at halftime. They are now on the same accord and very excited to go out and play the second half of the game. Countless teams may be losing at halftime but end up winning the game. Many fans often say, “I wonder what they talked about at halftime that turned them around?” This is a sneak peek into that reality. There are basketball players all over the world that have been around this type of scenario. Being able to display these familiar moments is extremely important, in order jog ones memory. This is key to causing one to reminisce. To date the “Reminiscent Video Ad” entitled “Dream Big, Go Hard” has 58,608 views and “Day 1” has 688,564 which is 192,172 more views than the other one. With this style of video, the more reminiscent trigger you have the better. If you didn’t play organized basketball the halftime speech may not connect with you. That video is geared towards a smaller section of the population compared to “Day 1”.There are a lot of woman that can relate to supporting their child’s dreams without the presence of the father; parents that push the student athletic “school of thought”; basketball players that remember street ball games or some that may even still play. Many athletes have had to fight through sports injuries thus, the ankle bathroom scene can draw a connection. Being a new apparel and footwear company in the basketball space and having 1.435,736 (and counting) people know your company’s brand isn’t a bad entry into the category. Some start ups never get to that point. This is merely a springboard for CourtSmith Basketball. If you want people to reminisce about Basketball or learning how to cook, the goal should be the same. One must make people think of a certain time in their life- the same way in which music and fragrances can. It is believed that it’s a bad idea for a man or woman to buy older cologne or perfumes. The idea is that the smell can trigger thoughts of ex- boyfriends, husbands, wives, etc. Often times this can be a part of a person’s life they are trying to move past for various reason. The last thing they need is a familiar fragrance that takes them to a dark time in their life. As it pertains to this style of video AD, the goal of production would be to recall memories very similar to the ways in which Santa Claus does for Christmas.